So far, we covered a full bust adjustment for Anise today. Here’s another set of alterations you can do from The Anise Companion: adjusting for wide or narrow shoulders. 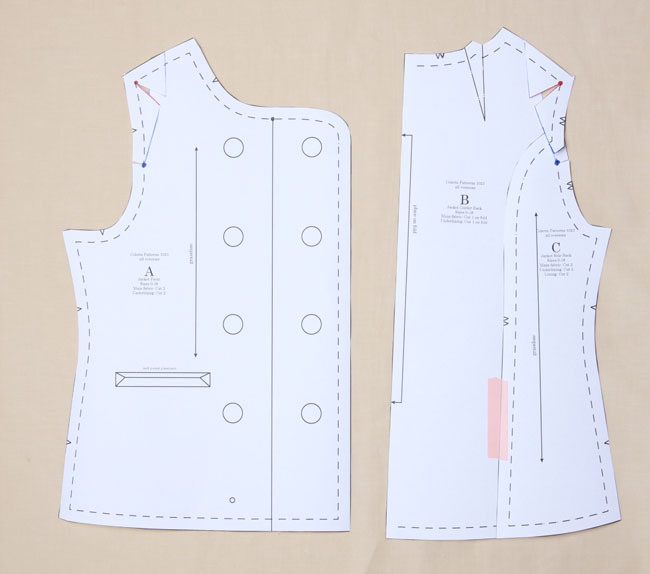 First, be sure to take a look at the blog post on fitting. It goes over the techniques we’ll be using for slashing and pivoting the pattern in order to make adjustments. How do you know if you need an adjustment for shoulder width? If your shoulders are wide, the jacket might feel tight across the back. In front, it pulls across the upper chest. The armhole seams appear to be pulling in towards each other with the strain from your shoulders. For narrow shoulders, the armholes seem to sit too far out and off the shoulder. There is excess fabric across the upper chest and upper back. Here’s how to adjust for these two common fitting problems. Draw a pivot point at the low shoulder, and another along the armhole. Draw a line from the armhole point towards the middle of the shoulder. Draw another line from the first line to the low shoulder pivot point. Slash the lines up to the pivot points and clip into the seam allowances. Pivot the first line outward to make the shoulder wider. Pivot the second line inward to realign the shoulder seam. Make the same adjustment to the pattern back. Adjust lining pieces to match. You’ll be drawing the same lines and points described above for wide shoulders. 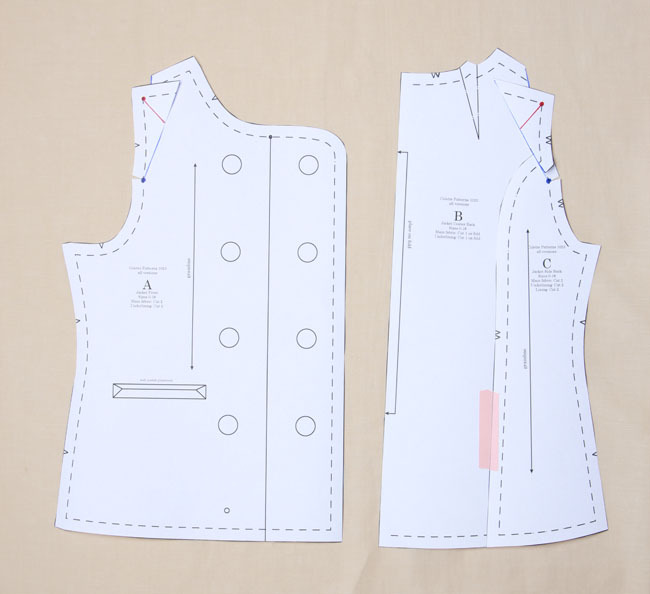 Draw a pivot point at the low shoulder, and another along the armhole. Draw a line from the armhole point towards the middle of the shoulder. Draw another line from the first line to the low shoulder pivot point. Slash the lines up to the pivot points and clip into the seam allowances. Pivot the first line inward to make the shoulder narrower. Pivot the second line outward to realign the shoulder seam. I haven’t started my muslin yet but I’m pretty sure I’m going to need to this adjustment. In fact, I’m really excited that I’m going to finally learn how to do it since so many of my clothes are too wide in the shoulders. 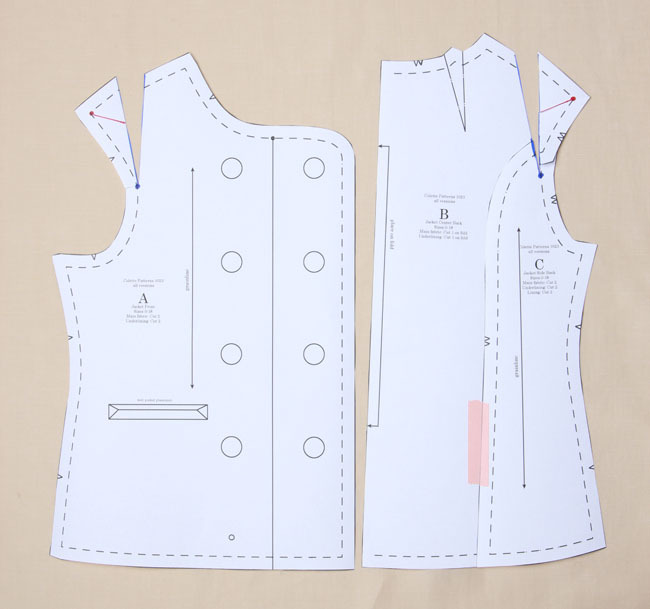 One question: how do we translate the alterations made in these pieces to the lining pieces? Should we keep track of the size of the adjustments now for fiuture use? 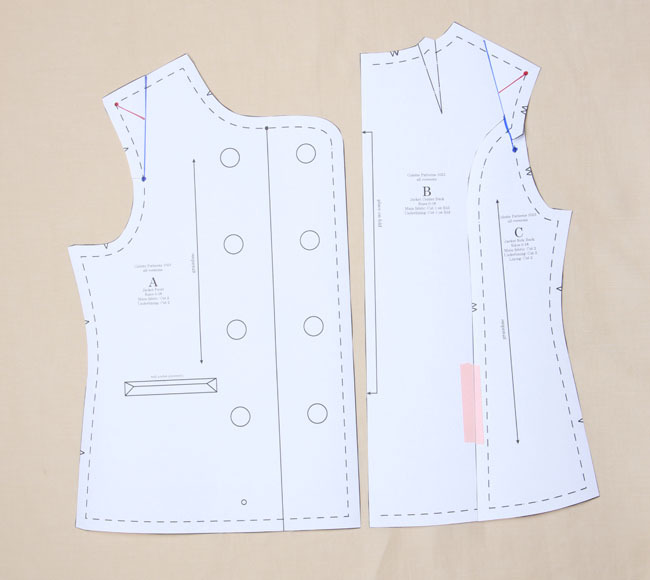 You can do it that way, or just trace the adjustments onto the lining pieces. For the center back, just fold the back pleat on the lining out of the way. In my case there is excess fabric even lower down the back, until approximately 1” below the end of the armpit- it seems that I need to take in fabric all along the armhole by almost 1”. How should I address this? Could I take my second pivot point in the side seam and move all of the armhole in? Hmm, I’m trying to visualize this. Could you remove the excess fabric from the princess seam in the back? oh my god, it’s like you have just handed me the holy grail!!! All the ladies with big swimmers’ shoulders rejoice!!! Hi I’m so glad I’ve been frequenting your blog for a bit now, I’m beginning my own fall/winter wardrobe and needed tutorials on putting in sleeves etc….and then I found this. If I’ve already pretty much sewn everything together and discovered that I’m narrow shouldered (who would”ve guessed??) is it too late to make this adjustment to get the sleeve to sit in correctly without looking like it’s falling off my shoulder? Have you already set the sleeve? You could perhaps remove some width from the armhole, but this is tricky because it will alter the armhole. You want to try and maintain the size and shape of the armhole as much as possible while bringing it in a bit. I haven’t set the sleeve yet, I pinned it to the blouse and thought it looked weird, came to your site for your tutorials and saw this…my blouse has those princess seams kinda like your jacket so I thought I’d give this idea a try. Thank you for your advice I was kinda feeling like that may work (tricky as it seems)!! I seem to have to much room in the back (lower half part). My teacher told me to make an extra seam in the middle of the back part. That was the jacket is more fitting. But I am nog sure if I like it that way. Is there another way to get rid of the room in the area? If you want it to be a little more fitted at the back, you could take some out of the princess seams in back for sure! A Dart! that’s the word I was searching for…So she told met to make a dart in the midlle. But that’s changed the ‘boxy’ shape of the jacket..Is there another way? In addition to the narrow shoulder adjustment, I need to shorten the sleeves by about 1 1/2 inches. Does it matter where I slash the pattern pieces? Thanks. I would do this somewhere between the elbow and the cuff fold line. Oh thank you thank you. One of the reasons I’m so interested in sewing is my broad shoulders. This adjustment is so simple and elegant, I love it. I’m not sure which adjustment I need. The shoulder seam is sitting too far down my arm (narrow shoulders?) BUT the armholes feel very tight, and there are horizontal wrinkles emanating from the armhole. I have a ton of extra fabric in the across the back, also. Thanks for your help. Nicole, I’m in a similar situation with the armholes. My muslin fits well in the back and bust, but the shoulders and armhole are tight. With this size, in addition to figuring out the armhole situation, I’d have to make the shoulders wider and do a large bicep adjustment. Based on some reading that I did and an earlier comment from Sarai, I’m getting the impression that if the armhole doesn’t fit, it’s best to cut a new size so that the armhole fits and then make other adjustments from there (in my case, I’d need to make the bust and back smaller). Does anybody agree/disagree? Thanks! I made the FBA and the narrow shoulder adjustment but still had problems with the armholes. It looks like I need to make the sleeve wider in the upper part (a bit higher than the bicep) and bring up the bottom part of the armhole. I’m not sure this makes sense, so to say it a different way, the sleeve pulls across my upper arm but there’s way too much fabric in the armpit. The fit is fine everywhere else. When you make an adjustment for the narrow shoulders, you then would have to adjust the sleeve cap since you would need to add more ease to the biceps right? So you would have to make it wider? does doing the adjustment for a narrower shoulder affect the way the sleeve fits into the armhole? I also have to do a FBA. Which do I do first? 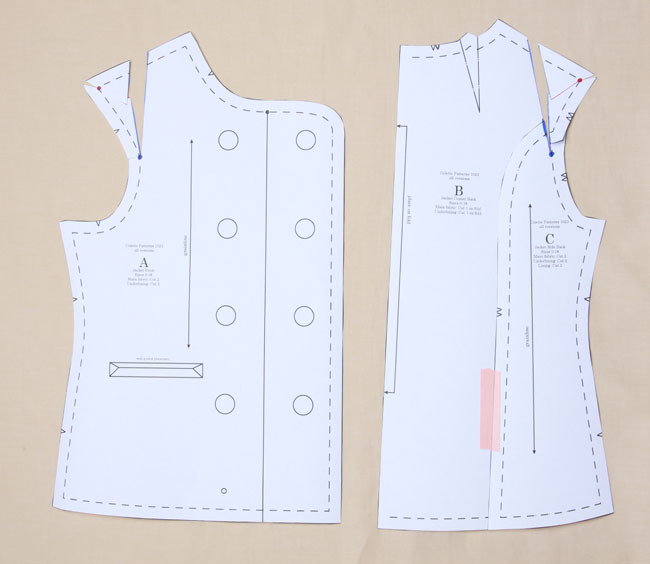 I have narrow shoulders, so I’m wondering, once I have done the adjustments to the pattern as you instruct, how I need to adjust the sleeve cap. Do I add some extra to the height of it comparable to how much i’ve taken out of the shoulder? You should not need to adjust the sleeve. The seamline remains the same when you pivot the pattern like this, so the sleeve should fit the armhole in the same way. All this is doing is, essentially, “pinching out” some of the shoulder width. I’m commenting again because I put this pattern down in October, because I couldn’t get the armhole to fit! (see my old comment above) Now I’ve finally gotten around to picking it back up again. Basically, the armholes feel very tight. I can’t put my arms out in front of me. The underarm seam doesn’t sit up into my underarm, it stands away from the body. The shoulder seam line sits down onto my armhole by 3/4″ or so. This is a common problem for me with sleeved garments, which is why I want to learn how to fix it. Lara (above) recommends cutting a larger size overall, but I’m hesitant to do that, because I usually need an SBA and the top back is already quite loose. Should I try making the sleeve larger at the top? I’m confused about how to do that with a 2-piece sleeve. Then do I alter the armhole, or leave it be? I have looked at Fit for Real People and a few others, and they don’t really cover this issue.